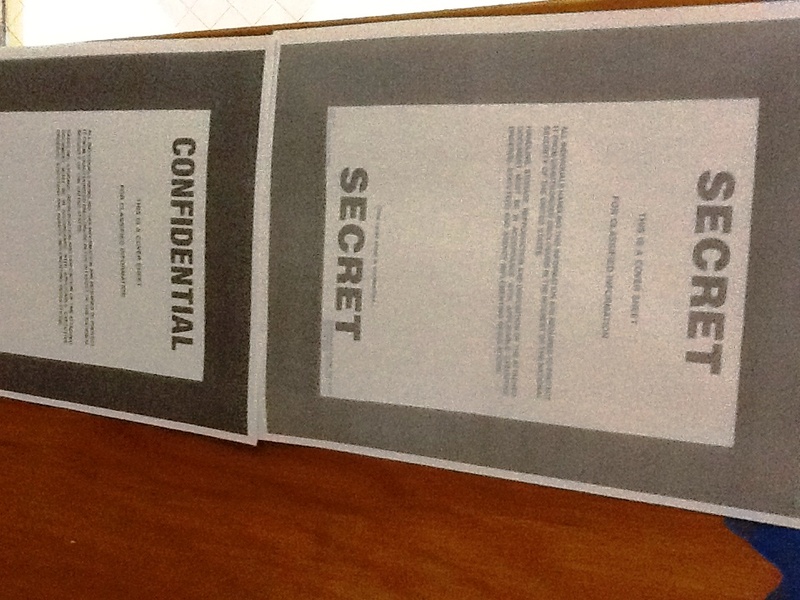 After all the meetings came the writing of the reports, and after all the reports came the gathering of the evidence. Finally, the evidence sits in eight bins in a room in the agricultural wing of the school ready for the volunteer accreditation team to review. What is most striking about the collected evidence is the variety. The evidence today contrasts to the evidence from the accreditation several years ago. For each lesson plan on paper, there is a digital lesson plan. For each student essay drafted, peer-reviewed, and handwritten on composition paper, there is a Google Doc with peer comments, and to see each draft, one need only check “see revision history.” Whether or not members of the NEASC committee check the revision histories of individual documents is not as important as how they will check the history we have provided in the evidence bins and websites. In looking at the evidence, the NEASC committee will note our academic housekeeping, and they will make recommendations as to how we should proceed in the future. 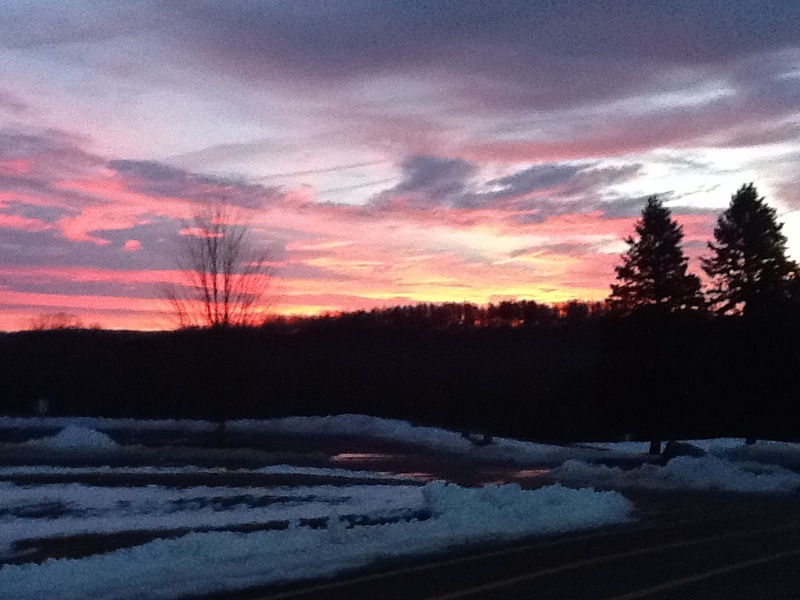 The entire school community has every right to be proud of Wamogo Regional High School, and recommendations from NEASC will help guide us in the future. But for tonight, the housecleaning and housekeeping is over. When driving home from school this evening, I was thinking about the arduous process we have all been engaged in over the past two years. I don’t believe there is a single member of our school community that hasn’t played a part in this important preparation. Many of you worked tirelessly on committees, writing reports, culling evidence, hanging student work, etc., etc., etc. 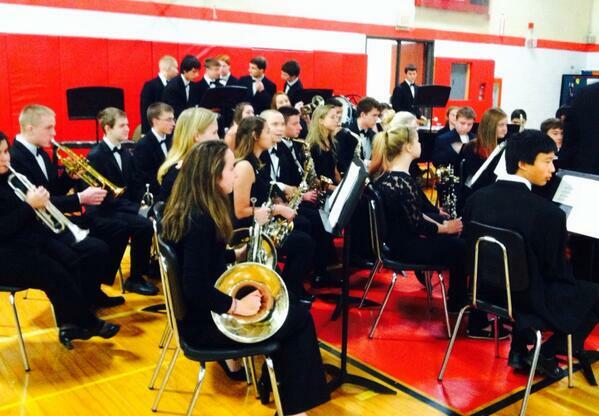 I just wanted to take a moment and thank the entire Wamogo community for the rally we have all engaged in to prepare for this important visit. I know that the visiting school will easily see what a special place Wamogo is and the obvious talents of our staff and students. I am extremely proud of our school and want you to enjoy showing the visiting committee what wonderful work you are doing with our students. 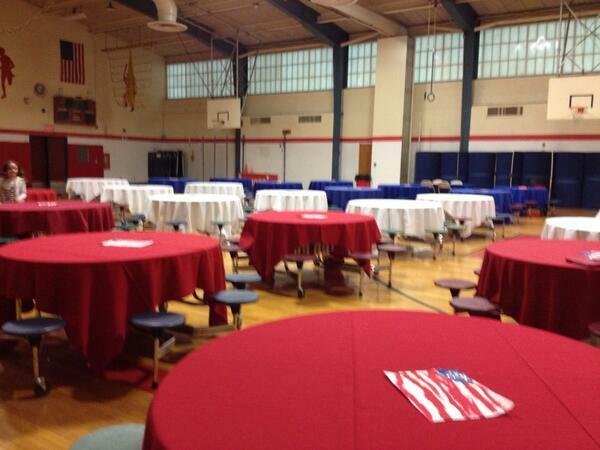 Welcome, NEASC. Our house is ready. 60 of my students met their first Hamlet on stage at Yale Repertory Theatre in New Haven, Connecticut, this past week. Their Hamlet was the actor Paul Giamatti, who after speaking 40% of the play’s 4,042 lines (roughly 1,440), came out onto the stage for an audience talkback to speak a few more words to them. “He looks tired,” on student remarked to me. The play had begun at 10:15 AM, and we were still sitting three and a half hours later as the actors and crew began to respond to questions. If we thought they looked tired, the actors seemed surprised to see us still sitting there. Students were curious about how the sets moved (“The stage has a large fly space.“). 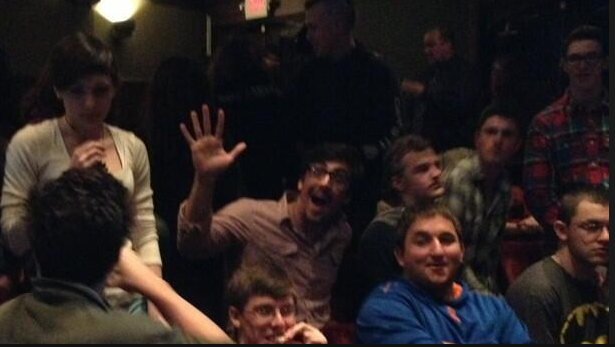 Students wondered how long the cast had rehearsed (“Eight weeks, a real luxury…”). Students wondered who was most like his or her character (“I understand Gertrude much more since I have a son”). 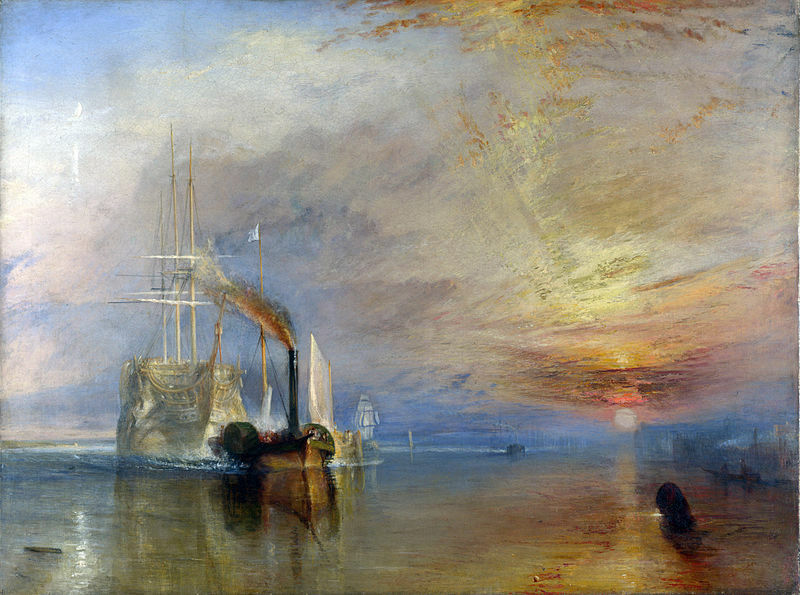 Students asked about the creation of set pieces including a large portrait (“That’s an oil painting from a photograph”). Shakespeare was meant to be live. Although the “perfection” of a movie is enhancing to the performance, it is unrealistic. I believe that watching a play live is important to seeing the different styles and methods possible. 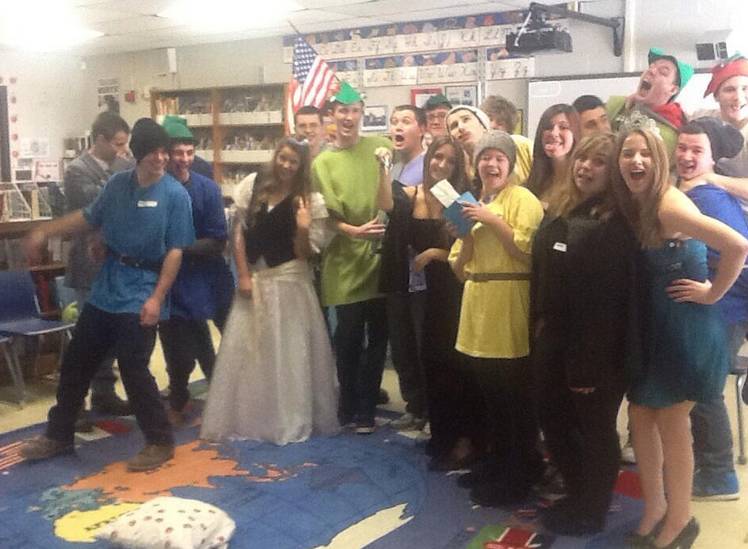 It was fun and a lot better than just reading it in class, it made it come alive. I did not think it was going to be as entertaining as it was. I also did not think I would find parts humorous, but I did. WILL POWER! is Yale Repertory Theatre’s annual educational initiative in conjunction with one of its productions and features specially-priced tickets and early school-time matinees for middle and high school student groups. The program also includes free professional development for educators, study guides and post-performance discussions with members of the company. One of the objectives of the WILLPOWER! series is to create new audiences, specifically younger audiences, for Shakespeare. Students who have attended a Shakespeare play may be more willing to attend another play when they are older; in other words, a favorable dramatic experience will yield future audiences for Yale Drama School graduates! I wouldnt mind going to another because it was so enjoyable that I didn’t even realize the 4 hours passing by. I like the way that a play has a certain kind of vibe. It’s like a live concert, where there’s a certain kind of energy. It was like seeing a live performance of a film. I would especially like to see another Shakespeare because it is the way that he intended his works to be portrayed. Perhaps the most satisfying moments of the actor’s talkback for teachers is hearing the actors say things that we wish our students would pay attention to in class. When Giammati was asked about how he felt about memorizing all those lines, he explained that he enjoyed learning the lines and playing on the open space of the stage. A first Hamlet they will remember. There are many great reasons to teach at the high school level: no outdoor recess duty, college level content, plus, a teacher never has to choose a “line leader”. Best of all, there are no bulletin board requirements. While most elementary school classroom walls are crammed with colorful thematic cut-outs (apples, shamrocks, stars), high school walls are monochromatic. While middle school classrooms have student work displayed regularly, an essay hung in September will curl and fade on the wall of a high school classroom twisting in the air like an ancient leaf of papyrus. Generally speaking, high school teachers do not spend a lot of time decorating the classroom. Subject content or motivational posters are the wall covering of choice, unchanged for the requisite 181 days of instruction. Perhaps it is inevitable that teachers who share classrooms do not personalize classrooms. However, for one brief part of the 3rd grading quarter, Read Across America Week (February 25-March 1st) changed the decorating habits of the faculty at Wamogo Middle/High School. 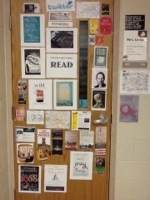 English teacher door…a wide rang of reading complete with motivational poster! 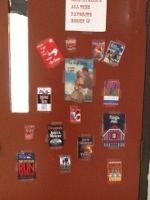 In a collective effort to demonstrate the importance of reading to students, teachers from every discipline decorated their classroom doors with materials they have read or are currently reading. 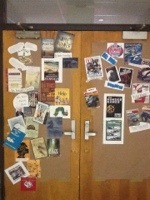 When sharing a door meant less space, this resource room teacher used a poster. 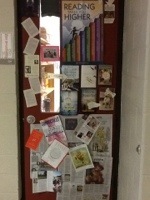 Social Studies (Gr 7) had this door and the side wall as well! The genre range (politics-humor-sports) was astounding! 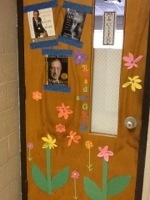 The Art teacher door centered around the command “READ”. Alternative education students had to walk through a double door display! 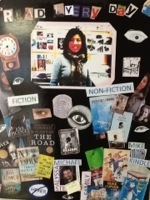 Students selected the books they read as well in this display. 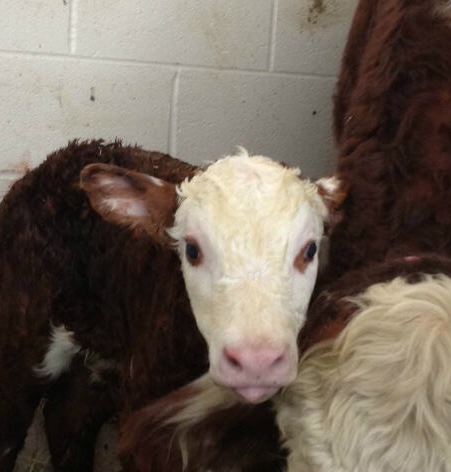 Admittedly, when the “Doors of Wamogo” was announced, there was a little hesitation. What would go on the door? When was this “due”? 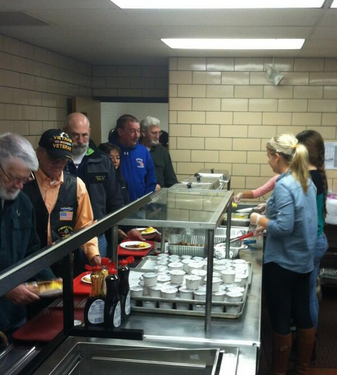 Finally, a few brave souls stepped up. First, there was the Social Studies teacher, an Army Reserve Colonel, who started by hanging “classified” documents on his door. His display was followed by the Business and Career Department teacher, also a basketball coach, who hung sports magazines and the cover of a Bobby Knight memoir. The English Department members, the Literary Specialist, and the media center Librarian displayed a range of the reading, from Where the Wild Things Are to Great Expectations. As the week went on, the competition became a little more intense. 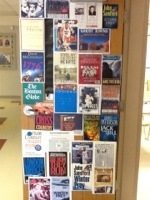 Finally, the Grade 8 Social Studies teacher simply emptied out his bookshelf and placed all his favorite texts alongside the door in addition to the door. Perhaps one of the more interesting outcomes was the sharing of titles between faculty and staff. “Oh, I loved that book!” one teacher would say to another. “This is a hard book, but well worth the effort,” said one teacher. “Yes, we read this in our ‘book club’!” exclaimed another. “Who is the Jody Picoult freak?” questions a science fiction reader. “How much Stephen King can you read?” was the retort. 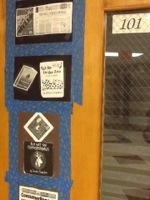 Math teacher places “Put Me in the Zoo” on his door; hopefully. this says more about his new baby daughter than the classes! Students had a chance to look at all the titles: assigned reading from high school that they currently are reading (Romeo and Juliet, Animal Farm), political/history books, and sports memoirs. There were magazine covers, newspaper mastheads, and comic strips. Blogger, WordPress, Twitter, Facebook logos were prominent, social media as informational texts. 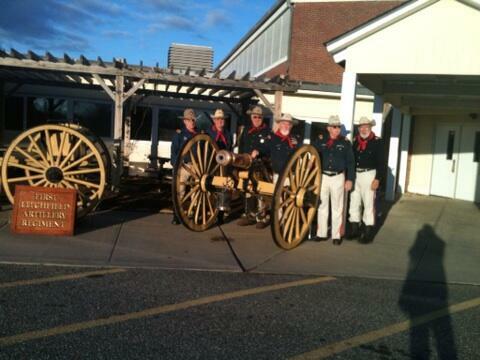 So what the “Doors of Wamogo” created for Read Across America Day in our small rural school was a very large window. 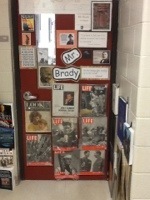 The doors provided a window into the lives of our faculty, a window for our students to see us as readers, and for our students to see what books made us successful. 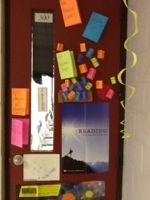 These doors illustrate how reading gave each teacher and staff member a chance to at the window of opportunity; reading = individual success. We had so much fun, we might try decorating again next year! 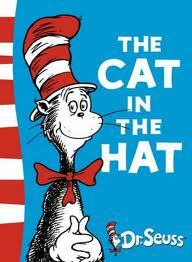 Happy Read Across America Day, 2013! Taking the playfulness of a Dr. Seuss motif to heart with replicas of books shared by students. The National Council of Teachers of English Annual Convention and the Council on English Leadership Convention begin this weekend (11/15-21) at the MGM Grand in Las Vegas, and I am so delighted to have the opportunity to present with my fellow faculty member, Stephanie Pixley, at three separate sessions. We are able to present to other teachers because of the great support and training our Regional School District #6 (Administration and Board of Education) has given its teachers in the use of technology in classrooms to improve student learning and develop 21st Century skills. Wamogo High School in Litchfield, Connecticut, is a 1:1 Bring Your Own Digital Device (BYOD) school for grades 9-12, and we are learning everyday how our students’ use of technology has helped us differentiate our instruction, increase our students’ independence, and allow us to provide authentic tasks for our students. Last year, we used netbooks in our English and Social Studies classes and found how successfully technology could be used in reading and writing workshops at every grade level. This year, those netbooks have been moved to grades 7 and 8 for their use, and the high school students either provide their own devices or rent one from the school’s technology department..
We are looking forward to presenting and attending the wonderful selection of sessions over the next few days. This is certainly a wonderful opportunity for our own professional development and a chance for us to showcase our small but very forward thinking school district-Regional School District #6 ! _______School recognizes that each child is an individual; that all children are creative; that all children need to succeed. Therefore, _______ School respects the individual needs of children; fosters a caring and creative environment; and emphasizes the social, emotional, physical, intellectual development of each child. 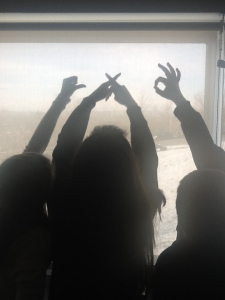 Our mission at ____ High School is to provide individualized education that addresses students’ unique learning styles, cultivates independent thought, and promotes the building of character, enabling them to contribute to their communities in meaningful and positive ways. The mission of _______Public Schools is to assure that, within a nurturing and stimulating environment, each of our diverse students and graduates achieves literacy and appropriate core competencies, and becomes a responsible and compassionate citizen. 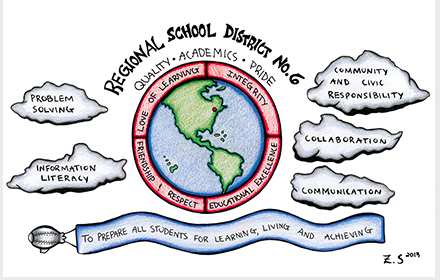 What is immediately apparent is that the language in the school mission statement Wordsift wordcloud is very different than the language in the CCSS Wordsift wordcloud. For example, the words education and school do not appear in the CCSS wordcloud; the words skill and knowledge do not appear in the school mission statements wordcloud. The word standard is emphasized in the CCSS wordcloud; the word child is emphasized in the school mission statement wordcloud. The word career is in the CCSS workcloud; its counterpart is citizen in the mission statement wordcloud. The words college, consistent, informed, provide dominate the CCSS wordcloud. The words creative, environment, individual, need dominate the school mission statement wordcloud. The word student is one of the few emphasized overlapping vocabulary choices. Neither mentions 21st century skills. I am not a fan of school mission statements. They are usually written by committee, and each successive rewrite makes the language in the statement generalized or vague or bland; I believe that “please all, please none” is the problem with a mission statement. However, one would hope that the differences in diction between a generic mission statement and the Common Core would not be so striking. Ultimately, these two ideas contribute to a common outcome; there should be some commonality other than an emphasis on the word student. Additionally, the difference is not only one of word choice, but also one of tone. The verbs assure, become, contribute, cultivate, foster, promote, and recognize in the school mission statement wordcloud differ in tone from the few verbs build, define, learn, live, and graduate in the CCSS wordcloud. The adjectives caring, compassionate, diverse, individualized, stimulating in the school mission statement wordcloud differ in tone from aligned, appropriate, effective, expected, higher order, global and rigorous as adjectives in the CCSS wordcloud. The words social, public and character are not in the CCSS wordcloud; the words economy, benchmark and workforce are not in the mission statement wordcloud. Perhaps it is not a surprise that the language of the mission statements is more sensitive or empathetic in tone than the businesslike language of the CCSS. My random selection of the three school mission statement plus the statement of my own school cannot possibly speak for all school mission statements. There may be mission statements that have vastly different vocabulary. Regardless, this imperfect comparison highlights a gap in the language of these mission statements and the language of the CCSS. The goals and purpose of the Common Core should have something in common with goals and purpose of a school.